Or saffron, in English. I like the Spanish word better. It sounds more impressive. 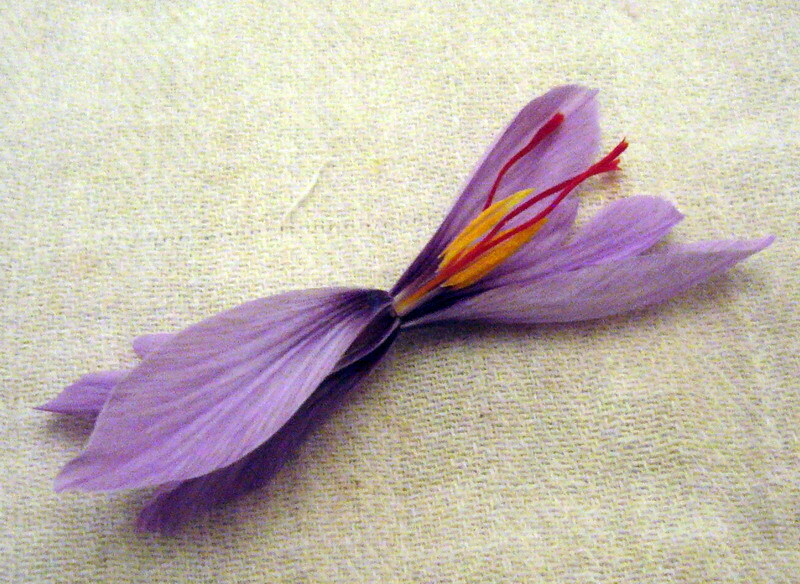 Saffron (Crocus sativus) is a species of fall-blooming crocus. I bought a few corms at the end of summer, but waited longer than I ought have to plant them. They’re borderline hardy around here, so I planted them in pots so I could bring them under protection when the really cold weather sets in. Given how late I planted them I’ve been really lucky that this fall has been unusually mild so far. 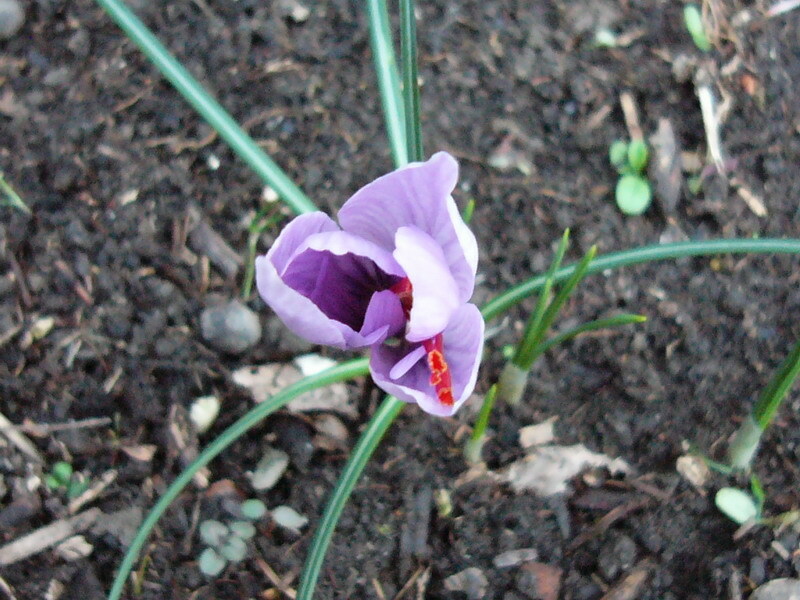 The note that the vendor (a local herb centre) sent said that corms planted this year wouldn’t flower until next year. Actually, one just flowered. 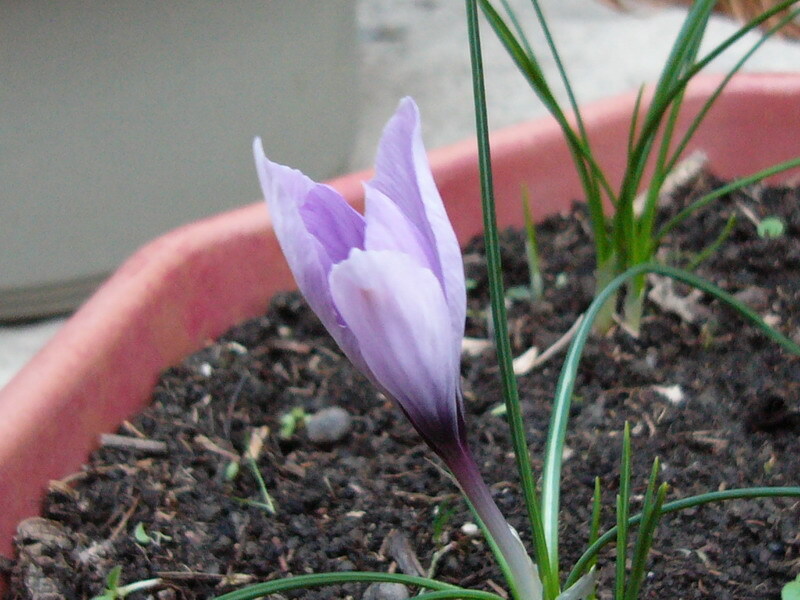 I’ve been very cagey about them and passing them off to anyone who asks as ordinary fall-blooming crocuses. It is the most expensive spice in the world, after all, and interestingly, the only temperate-climate member of the commercial spices (at least, those commonly known to most Westerners). Black pepper, nutmeg and mace, cinnamon, ginger, cloves, allspice, turmeric, cardamom, vanilla – those are all tropical or subtropical plants. … but the real reason is that I tried growing it before and failed, so I didn’t want to look a fool if didn’t work out this time either. I’m experimenting as usual; some are in garden compost, some are in leafmould, and a couple are in store-bought topsoil. Since this year’s growth comes from last year’s corms, I probably won’t notice any major differences (if any) until next year. The spice itself consists of the stigmas of the flower (the female part that gathers the pollen). Probably the main reason why it is the most expensive spice is that harvesting and processing it is very delicate and labour-intensive: nobody has worked out a good way to mechanise the process and so it all has to be done by hand. The flowers need to be picked at a certain stage, and then the stigmas are removed, dried, and stored in a moisture-free environment. 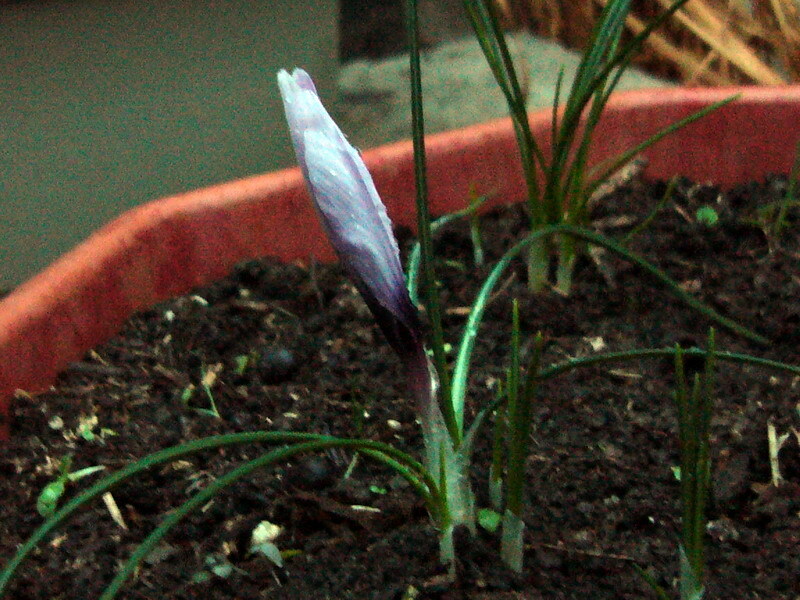 In this case, the bud emerged yesterday (nearly a month later than if I’d planted them on time). It’s a pity the flower needs to be picked – they’re quite pretty, really. The best time to harvest is considered in the morning just before the bud opens, so I picked it today. Morning wasn’t going to happen in my case, but yesterday and today were pretty damp and cloudy, so it didn’t open fully (as far as I know). When I brought it inside, the warmth encouraged it to open a bit more in the short time it took to fetch a kitchen cloth and put it on the table. 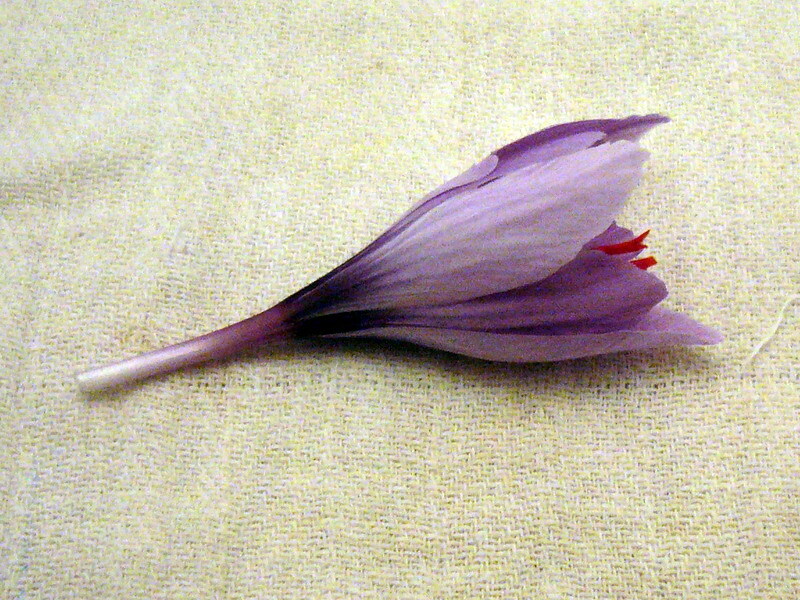 The flower is opened by removing or pulling back the tepals. The stigmas are the three long red slender structures; the yellow things are the pollen-bearing anthers. 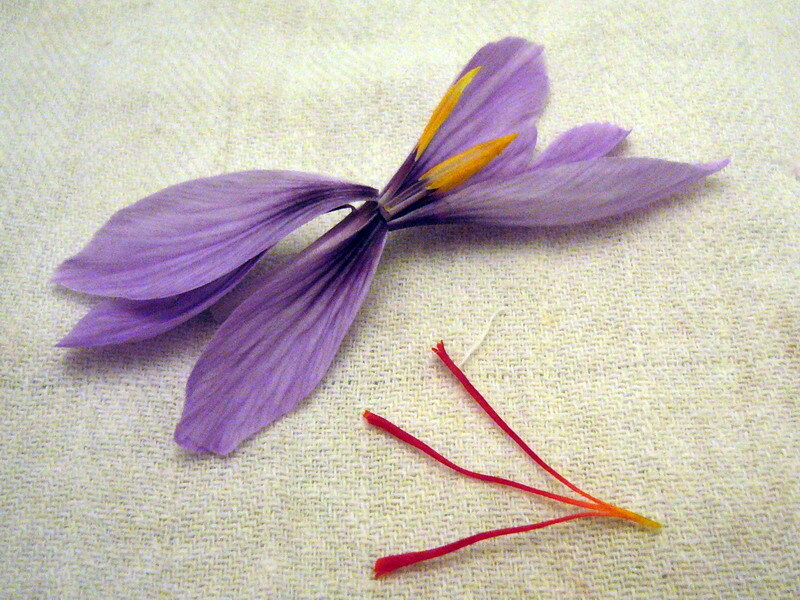 Even this one flower smelled incredibly good, better than dried saffron because it also had the aroma of honey. The fragrance stayed on my fingers for hours afterward. Here with the stigmas removed. You can see that it’s a tripartite structure extending from a single yellow style at the bottom; the style is not considered useful and is discarded. The anthers are usually discarded as well, but I’ve read that they are kept and somehow used in Spain. 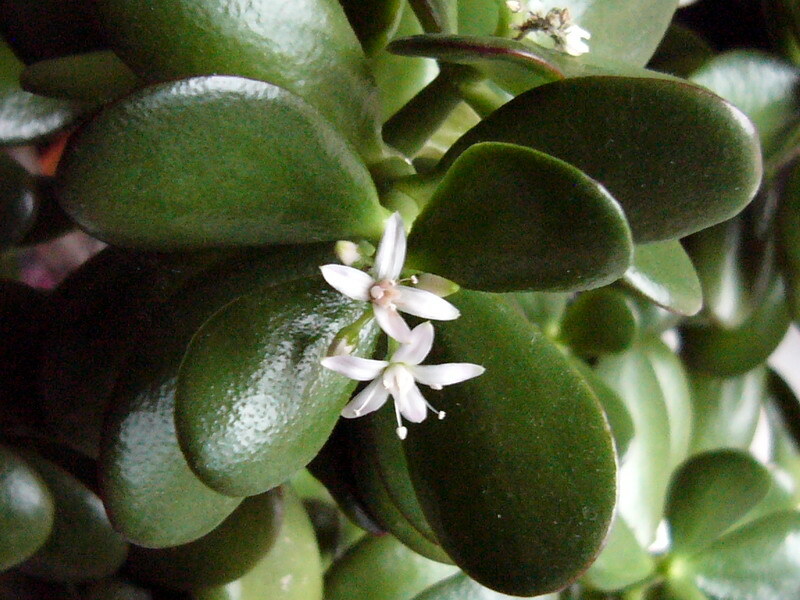 Flowering surprise number 4 this year, I think: the jade plant (Crassula ovata) flowered. Anyway, this plant is at least twelve years old, maybe fifteen, and this is the first time it’s flowered. In fact, I’ve never seen one flower in person before. I’ll admit I like it a little better now (but not enough to keep it if I could get away with giving it away). I find it interesting that on this same inflorescence, there is a tetramerous flower (4 of each part) and a pentamerous flower (5 of each part). Another thing is that the ‘Stella’ fig (Ficus carica ‘Stella’) is starting to resprout. I’m not very happy about this – I was really hoping to send it into dormancy and overwinter it in some out-of-the-way corner. It had already dropped most of its summer leaves and I was waiting for the last few to go yellow and fall, but they never did and now all the nodal buds are sprouting. Sigh. I really hope I can give it enough light so it has a chance to make it through to spring in good health.